“How to score maximum presentation marks,” in IB Review, September 2016. “Joining the conversation : citation and referencing for academic writing, not just academic honesty,” in IB Review, April 2016. “Honesty honestly, an alternative approach to academic honesty,” in The school library rocks: living it, learning it, loving it, accepted papers, volume I: Professional papers. edited by Lourense Das and others. International Association of School Librarianship, 2015. Chapters on “The extended essay,” “The role of the librarian,” and “Academic h onesty” in Introducing the IB Diploma Programme, edited by Marc Abrioux and Jill Rutherford. 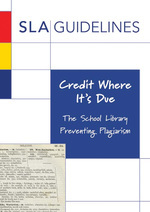 Cambridge: Cambridge University Press, 2013.
Credit where it’s due: the school library preventing plagiarism. Swindon: School Library Association, 2011. “Changing Attitudes: from Plagiarism and Punishment to Positive Practice.” Paper presented at the 4th International Plagiarism Conference, Newcastle, June 2010. “Walking two moons: crossing borders with international literature,” in Knowledge Quest 35 (2), November-December 2006. “From literacy to information literacy: reading for understanding in the real world,” in From Aesop to e­-book, selected papers, ed. Penny Moore et al. International Association of School Librarianship, 2004. Paper presented at the joint SLA/IASL Conference, Dublin, 2004. “Plagiarism: wheat and chaff,” in Access, 17 (3), August 2003. “Trust or trussed? 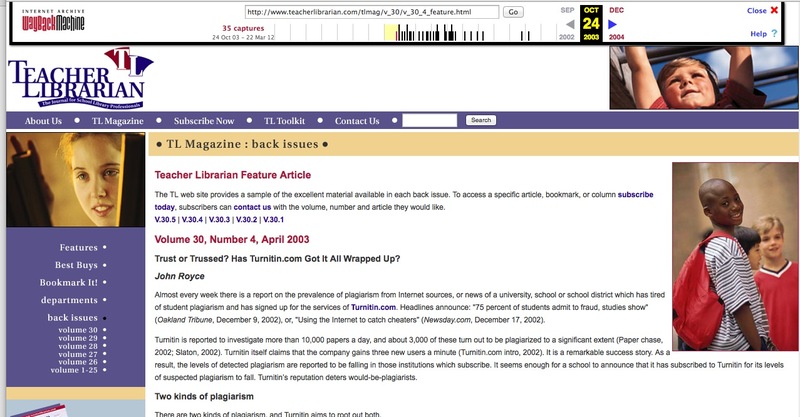 has Turnitin.com got it all wrapped up?” in Teacher-Librarian, 30 (4), April 2003. “Quis custodiet: investigating the investigators”, in The School Librarian, 49 (4), Winter 2001. “Where the truth lies,” in The School Librarian, 47 (3), Autumn 1999. “More than surviving: thriving in the information age: reading as a basis for using information technology efficiently,” in Education for all: culture, reading and information, selected papers, edited by Snunith Shoham and Moshe Yitzhaki. International Association of School Librarianship, 1998.Paper presented at the IASL Conference, Tel Aviv, 1998. “Surviving information overload: lessons from research in reading reluctance,” in School Libraries Worldwide, 3 (1), January 1997. “‘To read or not to read?’ was never the question,” in A Bridge in the Middle, the journal of the European League of Middle Level Education, 4 (1), December 1994. Contributor to and part of editorial team for Carolyn Markuson’s Effective libraries in International Schools, 2nd. ed. Petersfield: ECIS, 1999.